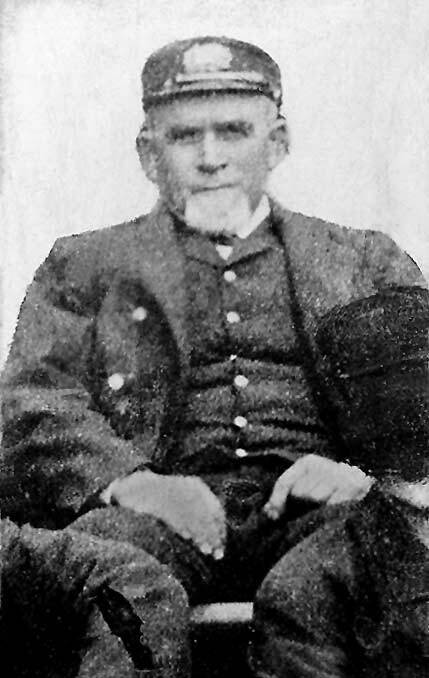 Introduction: Kathleen Hay sends information on her great-grandfather, John Brown, who worked on cables in the late 1800s for the French company La Compagnie Française des Câbles Télégraphiques. The photographer is listed on the back of this portrait as Gothards, 45 Plumstead Road [London SE 18]. John Brown was born in Ireland in 1841, and a letter to his wife, Annie, dated Dec 1, 1886, suggests that he was already at sea at that time. In July 1891 he was at Calais loading cable on CS Westmeath, which at that time was owned by W.T. Henley’s Telegraph Works Company and chartered by them to La Société Française des Télégraphes Sous-Marin to lay cables in the Caribbean. In 1893 the ship was sold to La Société Industrielle des Téléphones and renamed François Arago. In a letter to his son Tom, dated Oct 13, 1895, he mentions that Tom had worked at Henley’s. This work was with La Compagnie Française des Câbles Télégraphiques, the French cable company formed in 1896 by the merger of La Compagnie Française du Télégraphe de Paris à New York and La Société Française de Télégraphes Sous-Marin. The company owned two cable ships, CS Pouyer-Quertier and CS Contre Amiral Caubet. The Pouyer-Quertier was initially based at Le Havre, but moved to the Caribbean when the Caubet, formerly named Portena, was acquired by the company in 1896 and replaced the Pouyer-Quertier at Le Havre. John Brown left the harbour of the Seine River (Le Havre) in France in late March of 1897 to lay cable at St. Thomas in the Dutch West Indies. While on the cable expedition, he died of pneumonia on 23 May 1897 at Saint Pierre island. His death is listed in the city hall records on St. Pierre; the Maritime Archive there notes that he was transported by the ship’s captain and the assistant mayor of the city of Saint Pierre in a boat to the cemetery. The city hall records said he was a 54 year old English seaman with no known relatives. The cemetery at St. Pierre has a record of his burial, but no memorial for him can be found, although there was supposed to be one. The graveyard has many unreadable stones, and part of the graveyard has been moved to build a hockey stadium. 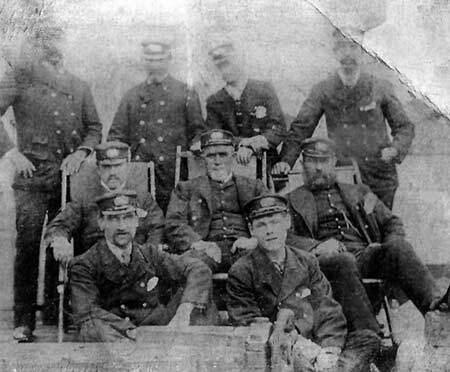 Captain John Brown (center) with his crew. taken on the Contre Amiral Caubet.